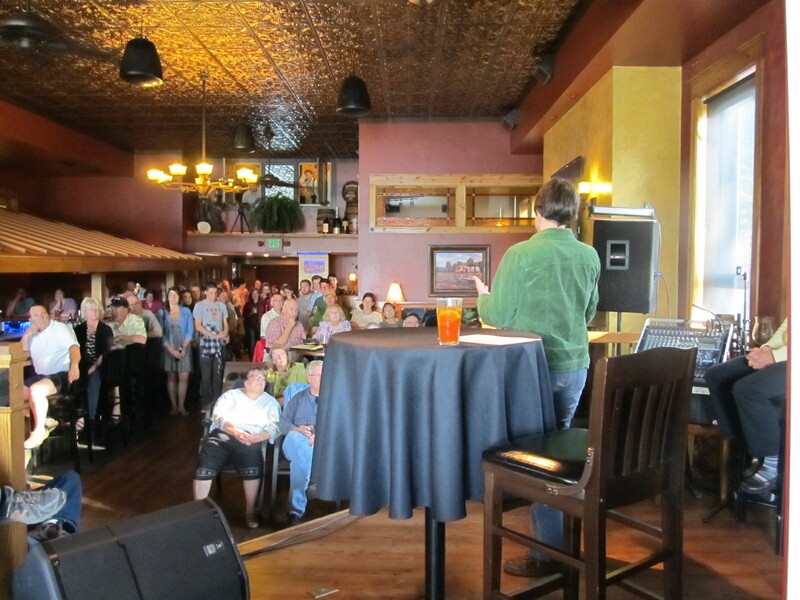 NTL researcher Adena Rissman leads the June 2015 Science On Tap, a monthly conversation in the Minocqua Brewery dedicated to the open discussion of scientific issues relevant to the community surrounding the NTL study site in northern Wisconsin. NTL researchers frequent the stage on nights like this, with scientists like Emily Stanley, Steve Carpenter, Tim Kratz, and Ankur Desai leading discussions on timely scientific and potentially hot button issues, ranging from climate change, to invasive species, to the future of the local recreational fishery. This June, NTL Principal Investigator Adena Rissman from the UW-Madison Department of Forest and Wildlife Ecology led a comprehensive Science on Tap discussion of recent trends in forest property ownership and forest management. Science on Tap’s tremendous success in the local community can be attributed to a number of factors unique to the science café format. The first is a strategic choice of venue. Though a bar is not the first place that comes to mind for scientific programming, speakers and audience alike enjoy the relaxed atmosphere of the local brewpub, where all perspectives are welcomed into a respectful discussion of occasionally sensitive topics. Second, presenters are allotted only 20 minutes to present the scope of the night’s discussion, leaving ample time for a more casual conversation as speakers answer questions and field input from the audience. This environment produces a lively, engaged community discussion that often extends well into the night. Finally, Science on Tap is live-streamed to the local Minocqua Public Library, where those unable to attend the brewpub can still participate in the discussion. It is also live-streamed online, where people around the world can tune in live or watch archived videos later on our website and YouTube channel. Science on Tap gives LTER scientists the chance to engage the public in mutual discussion of their research. They get the opportunity to hear the concerns, stories, and questions of community members and, in exchange, the community gains an understanding of how LTER research is relevant in their own lives. As we wrap up our 3rd year of bringing this important outreach to the Northwoods, we raise a glass to the more than 3000 visitors we’ve welcomed to our conversations and look forward to watching our audience, both in-house and online, continue to grow. Science on Tap is a partnership among the University of Wisconsin’s Trout Lake and Kemp Natural Resources Stations, the Minocqua Public Library, and the local chapter of the Wisconsin Alumni Association. For more information see http://www.scienceontapminocqua.org/.